Nihi Sumba is a surf expedition that every surfer needs to take at least once in their lives. It is a true 5 star experience and offers the rare opportunity to surf one of the best lefts in the world on an exclusive basis. It is also a trip you can take your family and was recently voted the worlds #1 hotel by Travel and Leisure Magazine for 2016 and 2017. There is nothing like it anywhere! Your immersion into Sumba life starts with the one and half hour journey from Tambolaka airport, leaving the bustling streets of Bali behind for a more Africa-meets-Asia experience. The journey starts at sea level and climbs to the rijewa mountain ranges at 500 metres. The spectacular scenery from peak to sky is framed by teak and mahogany plantations and thick Sumba deciduous forests. The road stretches down to Waikabubak passing through traditional settlements, the Sewah waterfalls and offers a canvas of rich green verdure; structured rice fields to river valleys and thick dense forests eventually leading to a glimpse of the Indian Ocean. The traditional market town of Waikabubak is situated 400 metres above sea level on a plateau and guests can often see water buffalo driven through the town on an evening drive. For the final part of the journey, you have magnificent views of the vast Wanokaka River Delta populated by local tribesmen grassing the rice fields, traditional swords in hand and wearing Ikat head scarves, winding through local villages to arrive at the magical setting of NIHI. Where you stay on vacation is more than just a hotel room. It is an experience. A new way of living. 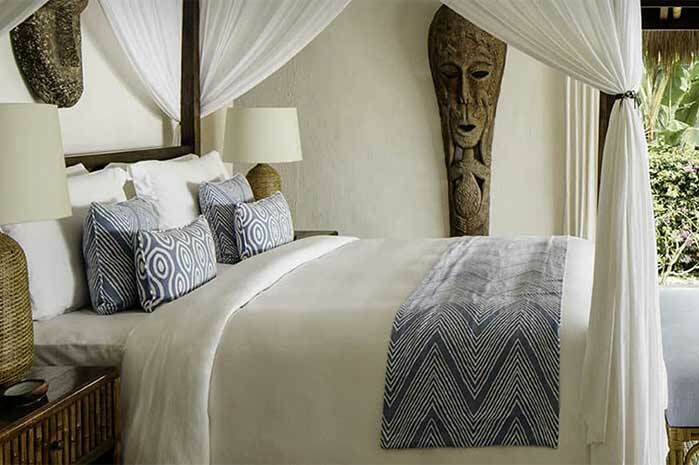 Every detail in Nihi’s rooms – crisp white bed linens on their signature canopy beds and sweeping panoramic views of the Indian ocean – is designed to make you feel both at home yet completely transported. Take a moment. Draw a deep breath into your lungs. Open your eyes and pull back the curtains of your bedroom. Miles and miles of blue ocean stretching in all directions. Your new home is Raja Mendaka. 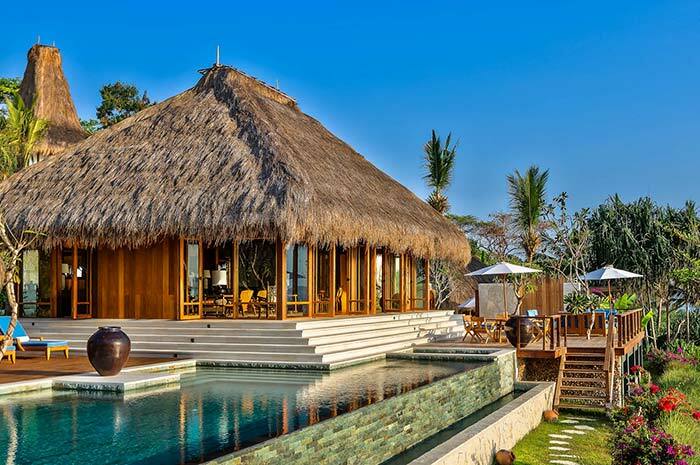 The owner’s five-villa estate and the crown jewel of Nihi Sumba Island. Give in to absolute luxury. You belong here. Book the entire five-villa Mendaka estate at the heart of the resort. This most expansive plot of land is designed with large families and groups of friends in mind. Its prominent, private passageway above the residence greets guests with a lounge to pause and enjoy the majestic view of the coastline. Descending down an imperial stone staircase, lush gardens and stone footpaths connect the villas, each set apart for maximum seclusion and the opportunity for individual bookings. Villa combinations available upon request. When reaching the edge of wildness isn’t enough, travel just a little more, farther down the path. 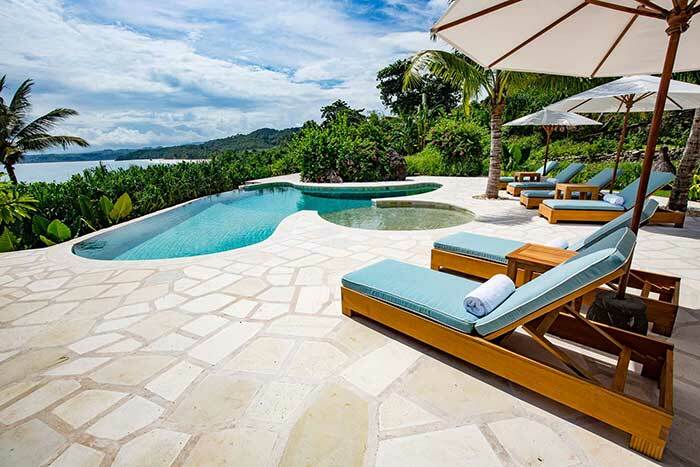 Reach Haweri: the most private estate in all of Nihi Sumba Island. Haweri is indeed the villa of abundance. 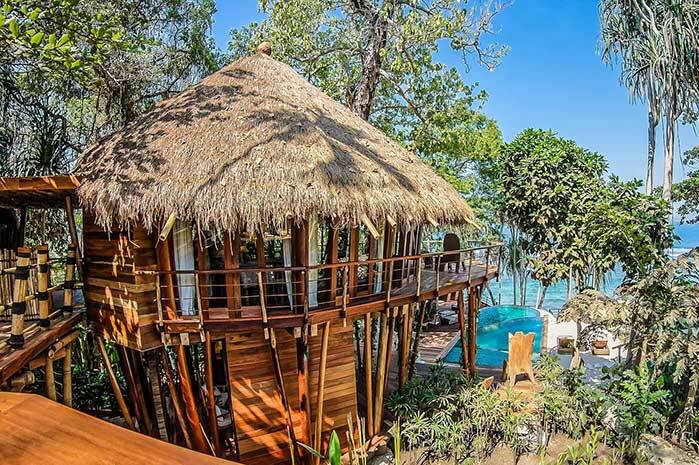 There are two large swimming pools, a ten person hot tub, a waterside yoga pavilion, a secluded bamboo bale above a private beach, and a spectacular living and dining room perched on a hilltop overlooking the coastline. For those seeking absolute privacy surrounded by nature at its best, this is the place to be. On the hilltop is the open air dining, living and entertaining pavilion with a fully equipped kitchen, fire place and two outdoor decks offering jaw dropping views in all directions. Below are the swimming pools and the villas, each individually designed and positioned to maximize the beautiful vista; giving a breathtaking perspective from each area of the property. Perched near the highest point of the resort above a hillside of organic gardens, Puncak comprises of two main villas, rented together. The villas share a sunken outdoor dining area and two pools. 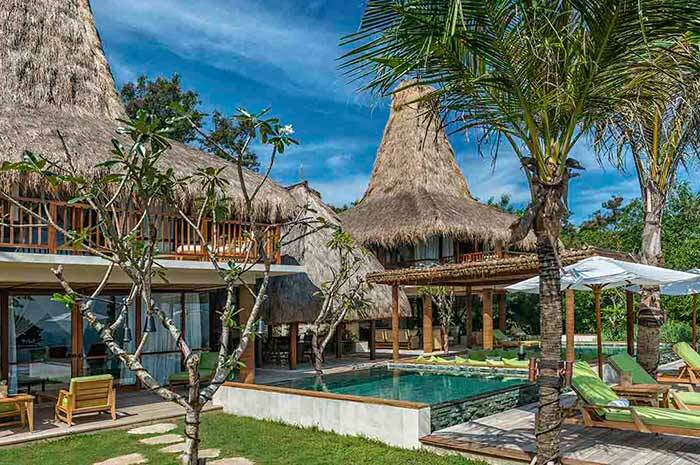 The two-bedroom villa includes a bedroom each upstairs and downstairs with adjacent bathrooms. The one-bedroom villa includes a ground floor covered living room and a study that can be used as a second bedroom, or to relax, watch movies, or work. The four-bedroom property can be rented out for large groups of families or friends. Its spectacular views and large outdoor space make it a one of a kind experience for those looking to relax and spread out. Tucked away in the trees. Complete peace. Complete quiet. Dramatic views. Your own private outdoor lounge and large swimming pool. Welcome to Wamoro. Your stately jungle hideaway. The entire four-bedroom estate can be rented out to large groups. Its generous outdoor accommodations, private entrances and luxuriously appointed interiors make it ideal for families or groups of friends. Your lush backyard leads straight to the Indian ocean. 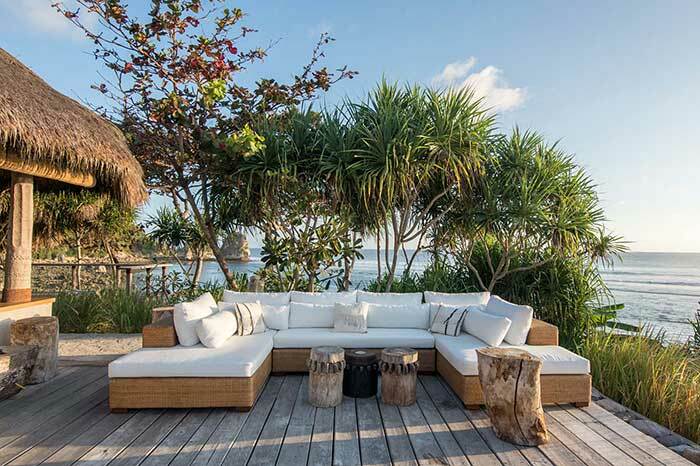 Your private outdoor bed overlooks a seaside cliff. Your grand soaking tub is made for two. Your dining table is poised to serve dinners in soft night air. You are in Marangga. 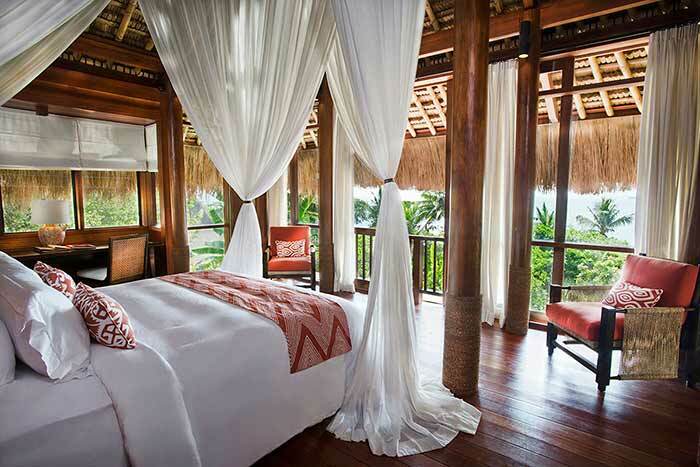 Nihi Sumba Island’s most intimate hideaway. 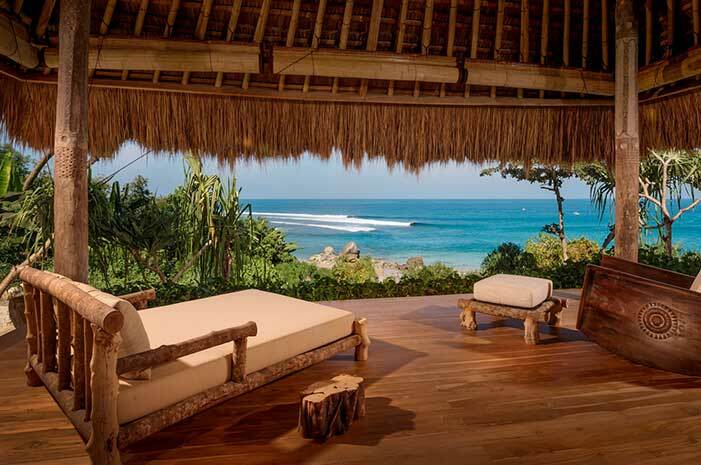 Marangga is a single level master bedroom and bathroom estate with its own private gardens leading directly to the ocean. 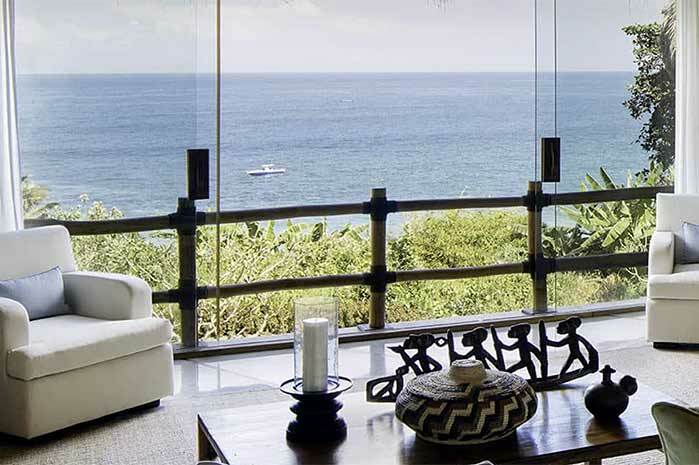 At the foot of the property with panoramic views of the Indian ocean is a private cliffside bale. Inside the private bale is king sized day bed that can be appropriated for any number of uses: catered lunches during the day, massages at sunset and even made up in bed linens and canopy netting as a romantic seaside bedroom for sleeping at night. 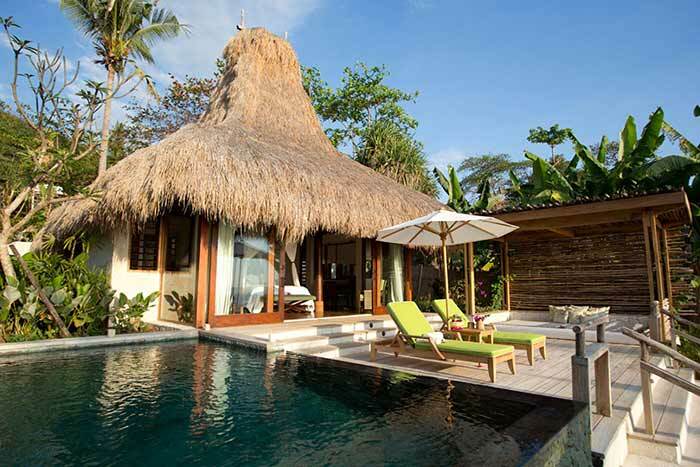 Each Marangga has its own private plunge pool, outdoor shower and dining area. Tucked away. Private. Intimate. Cozy. Watch the waves at the edge of your private lawn. Feel beach at your fingertips. Listen to the chirping birds in your private garden. Welcome to Lamba, secluded and convenient. Paradise. 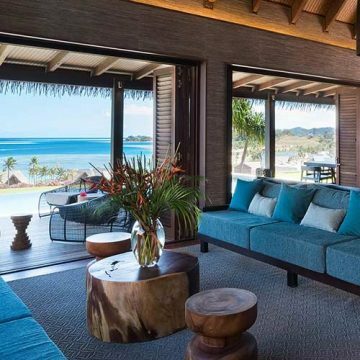 Built entirely on one level, each of the two Lamba estates features an exquisitely appointed master bedroom that opens out onto a deck with lounge chairs, an upholstered day bed and teak cabana next to a private plunge pool. A rambling backyard, private garden and outdoor shower with ocean views complete the scene. Ideal for couples looking for a sense of privacy and the perfect amount of space, Lamba is the jewel tucked conveniently away in the heart of the resort. Can be rented separately or connected for families and friends. Spacious rooms, exquisite interiors, beautifully appointed at every turn. A shaded living area that welcomes just enough sunlight. The perfect amount of space. This is Lulu. For those who appreciate luxury and design. The Lulu one-bedroom villa is made up of a master bedroom with en-suite bathroom and outdoor tub, connecting to a living room or children’s bedroom with en-suite bathroom and outdoor shower. The two bedroom Lulu villa includes a master bedroom connecting to a children’s bedroom with two daybeds, one en-suite sharing bathroom, and a spacious living room with guest bathroom. Each Lulu villa features a terrace and decking with an outdoor Bale for dining, and a private plunge pool. Each one-bedroom villa is made up of two generously proportioned stories. The first floor houses a powder room and a luxurious open air living area that overlooks a sprawling deck with a private infinity pool. The second floor features a large master bedroom, the hero of which is a signature canopy bed with dramatic ocean views. Dining punctuates the day. It brings on the morning and closes out the night. It gives meaning to each hour. As such we’ve taken great care designing the dining experience for our guests. Our menus are crafted to recall local flavors and far flung tastes, using fresh produce from our on site organic garden. Local fish is caught and brought up daily from our shores to be prepared in a new way every night. Toast is always cooked over an open fire, never in a toaster. We invite you to experience the details that make Nihi Sumba Island a singular culinary experience. The hub of social activity is the main sandy-floored Ombak (meaning wave front) restaurant and bar lounge. Ombak, an exquisitely crafted open-air restaurant, serves a la carte breakfast and dinner daily with a relaxed convivial atmosphere. During the week they create special dining experiences including spectacular BBQs. Just bare footsteps from the sea, the Nio Beach Club offers open-aired pavilions and the Kapten’s Goa (Captain’s Cave) serving the highest quality of fresh ingredients for lunch: whether it is a fish just caught from sea, delicious vegetables and legumes from our three thriving organic gardens, items from the grill, daily rotisserie or freshly made pizzas from our wood fired clay oven, the Chef and his brigade will satiate your appetite with sumptuously healthy dishes. The newest addition is a state-of-the-art resort lap pool, perched on the Edge of Wildness with soothing, cooling, and epic views of the ocean, sunsets, Occy’s Left and local village life during low tides. Lunch or snacks are served by the pool, and for special occasions, Nihi creates magical settings for romantic dinners. Sumba has a semi-arid climate. 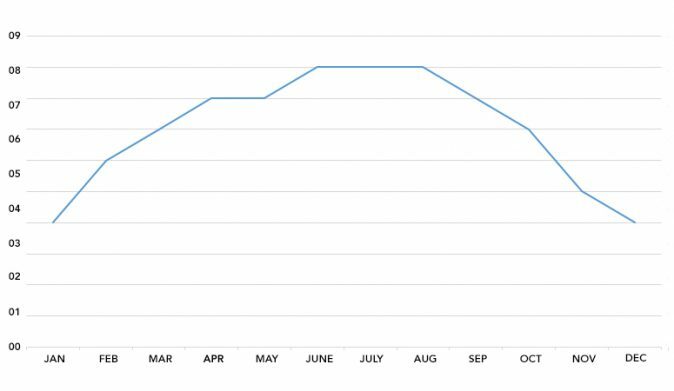 There is a dry season from May to October. 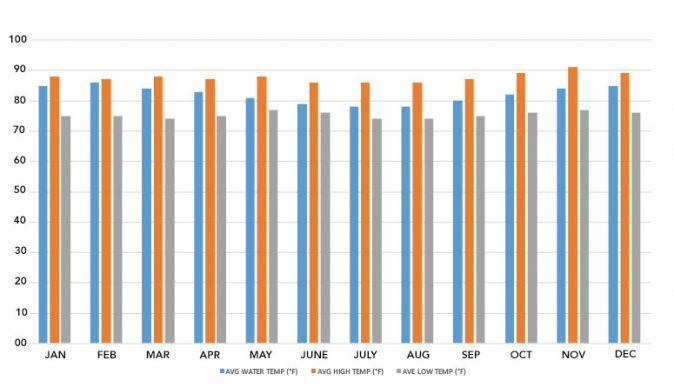 From November to April it might rain but expect warm days and comfortable nights. The best time for traveling is from April to July, after the monsoon, when it does not rain any longer, and when it is still green. In the Southwest of the island the period from October to mid-December is also possible, when it becomes a little green due to sporadic rains. Guests can participate in our scheduled group yoga & meditation classes at the Yoga Pavilion. Your stay is exclusive of alcoholic beverages, activities, airfare, airport transfers, Sumba market / Shop’s purchases and accommodation in Bali. 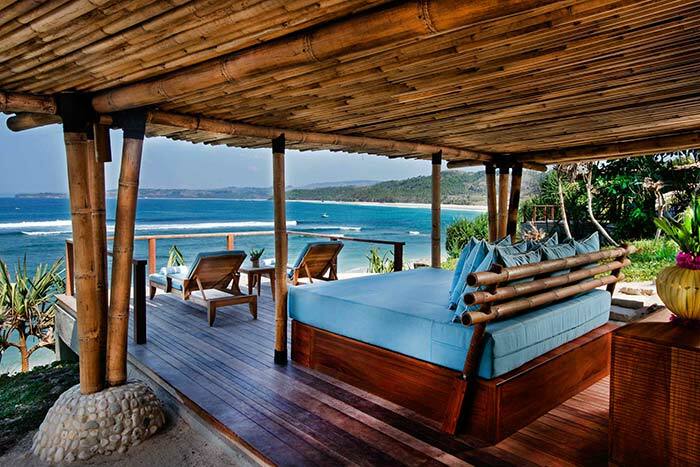 Nihi Sumba Island is host to one of the world’s most coveted private waves. Known as “God’s Left,” or often “Occy’s Left” (after Australian surfer Mark Occhilupo), the wave is popular for its character. Even for the most experienced surfer it presents a challenge because it is so sensitive to different conditions: tides, size, strength, and direction. Catching a good ride isn’t as easy as it looks, but once you make the right pick, the reward is a 200m to 300m long and often thrilling ride down the line through sections of ripple walls and heaving barrels. We reserve the amount of surfers to 10 per day, adding to the special experience. The wave has been a popular one for avid, recreational, and professional surfers for decades. Novice and first-time surfers can still get their feet wet with lessons on Occy’s, depending on the swell. Calmer waters can often be found at nearby Coconut Cove, where surfers can spend half a day with breakfast or lunch and do some light surfing, then be driven back to the resort. 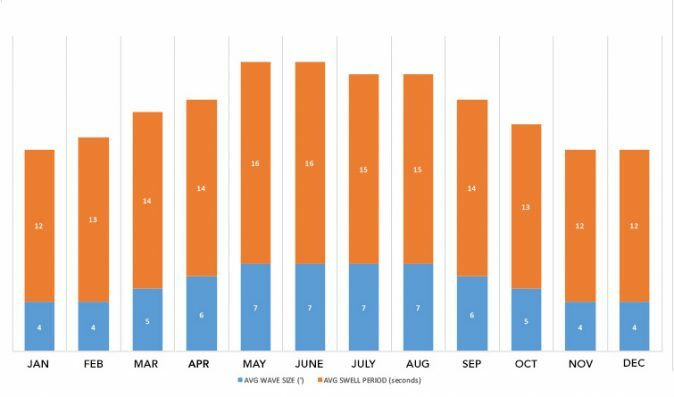 To maintain a surfing experience unparalleled in the world, it is Nihi’s intent to limit the wave to ten registered surfers per day. It is essential to reserve your slot (maximum 1 per Villa and according to availability) at the time of your trip confirmation to avoid disappointment. Surf slots can only be reserved by accomplished surfers. Beginner surfers need not book a surf slot, as surf lessons are booked to secure the services of a Nihi Sumba Island Waterman & Surf Instructor. For beginner and intermediate surfers, there are fantastic neighbouring waves that can be traveled to by boat, or car, at an additional charge.